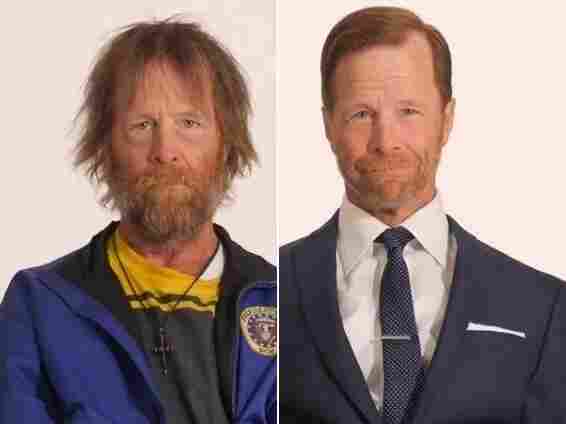 Homeless Veteran's Makeover Goes Viral: VIDEO : The Two-Way Millions have watched as Jim Wolf is transformed. The scruffy vet becomes a stylish looking guy. The video's producer says he wants people to view the homeless differently. On this Veterans Day, a video showing a homeless veteran's transformation as a stylist cuts his hair, trims his beard and puts him in a new suit, is going viral. It's already drawn more than 10 million views in just 5 days. Created by producer and marketer Rob Bliss to benefit the Degage Ministries charitable organization in Grand Rapids, Mich., the video is a time lapse clip of local veteran Jim Wolf. As stylist Anna Walt clips, shaves and styles Wolf, he turns from a scruffy, bearded man into a stylish looking guy. "For decades, Jim has struggled with poverty, homelessness and alcoholism. In September 2013, he volunteered to go through this physical transformation. ... Since filming, Jim has taken control of his life. He is now scheduled to have his own housing and is attending Alcoholics Anonymous meetings for the first time ever." The video ends with a request for donations to the Degage Ministries, "to help transform the lives of other homeless veterans, inside and out." Jim Wolf of Grand Rapids, Mich. The Army veteran was transformed for a video that the maker hopes will convince people to look at the homeless differently. Bliss, the producer, told The Blaze last week that "the homeless are people we ignore every day." So, he aimed to create a video that shows how "they can look like they're meant for the cover of GQ — they have that potential too." Bliss also told The Blaze he hopes the video gets people "to look at any homeless person on the street and see the mirror image of them — the image of someone who would look socially acceptable — realize that potential, that 'what if,' and root for their success." Walt, the stylist, tells MLive that Wolf couldn't see what she was doing during the 5-hour styling process. But when a mirror was brought out at the end, MLive writes, he at first "sat in silence, visibly shocked. It took a minute to set in. Then he threw his hands in the air, Walt said. He was so excited. 'It was like a little kid bouncing off the walls,' " said Walt. According to MLive, Walt met Wolf "the day before he would undergo a total makeover and was immediately struck by his charismatic personality. Wolf talked about the Detroit Lions. He spoke of the Detroit Tigers. He shared memories of his mother. He talked of how proud he was of a sister who manages a thrift store. 'I expected him to be a little quiet and a little shy,' Walt said. 'He just had story after story.' "
As of Monday morning, the video had nearly 46,000 "likes" on YouTube — to about 1,400 "dislikes." -- "Doolittle Raiders Offer Last Toast To 71-Year-Old Mission," on Monday's Morning Edition. -- "Vets-Turned-Firefighters Find Brotherhood, Purpose," also from Monday's Morning Edition. -- "We Pause On Veterans Day To Reread 'In Flanders Fields,' " a Two-Way post from 2011.